This tragic story has been told a million times in books, plays and movies. From Homer’s tale of Helen and Paris set in Troy nearly 3000 years ago, to Shakespeare’s impetuous Italian teens “Romeo and Juliet” penned in 1597, and Bernstein’s musical update relocated to New York City with Tony and Maria in the 1957 “West Side Story,” these cross-cultural romances rarely find a happy conclusion. 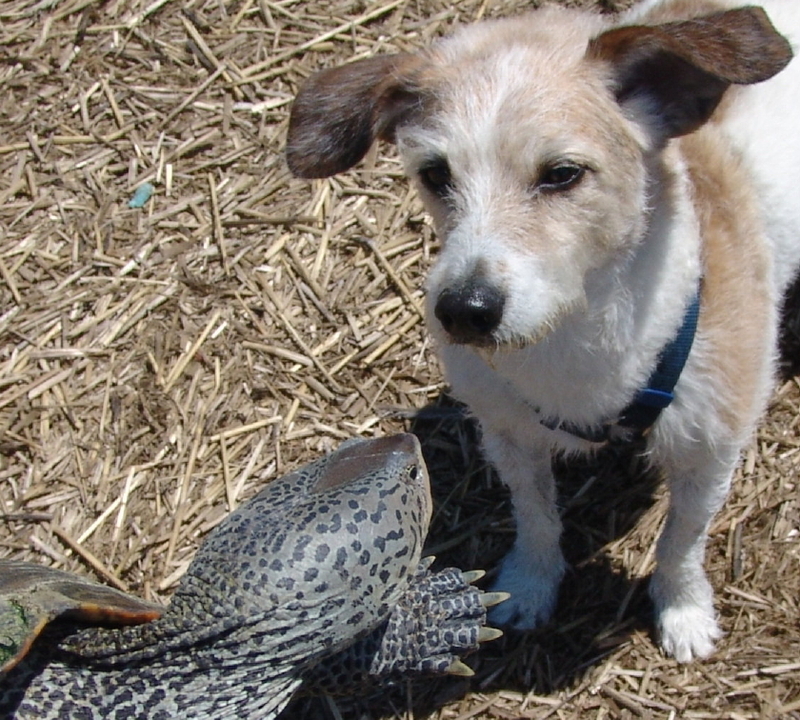 And so it was in the salt marsh of Chipman’s Cove one bright spring day when boy from the upland Canine Clan met girl from the brackish Reptile Family. From the first you knew nothing good would come of it. 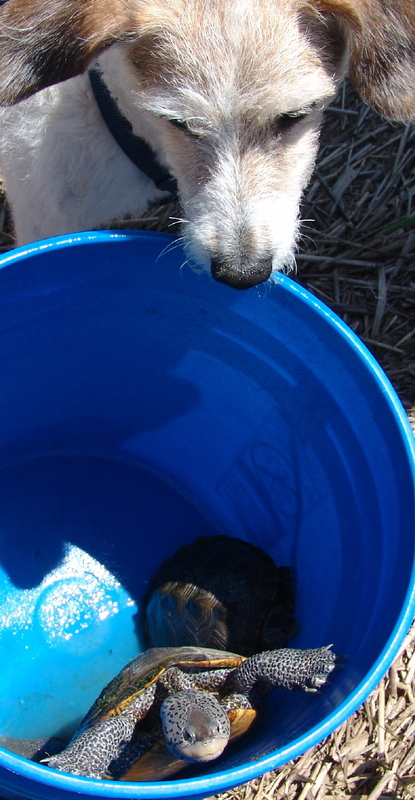 As the Turtle Journal team censused diamondback terrapins in their mating aggregation on the Outer Cape, along came an energetic canine boy to experience his first encounter with turtles. You could see his fascination from the first, as he strained on his leash to investigate these wonderful creatures with that exotic “Eau du Marsh Parfum.” He couldn’t restrain himself as he danced about to the rhythmic cadence of Jets and Sharks. It was love at first sight. He couldn’t take his eyes (or nose) off her as she strained in the bucket to flee his native uplands and escape to her more familiar lowland estuary home. The tragic ending came quickly as boy tried to express his devotion with a sniff and a kiss, and girl rejected his advance with a nip on the nose. Sadly, it was doomed from the start and could never have worked. They came from two different worlds that only met on a spring high tide. 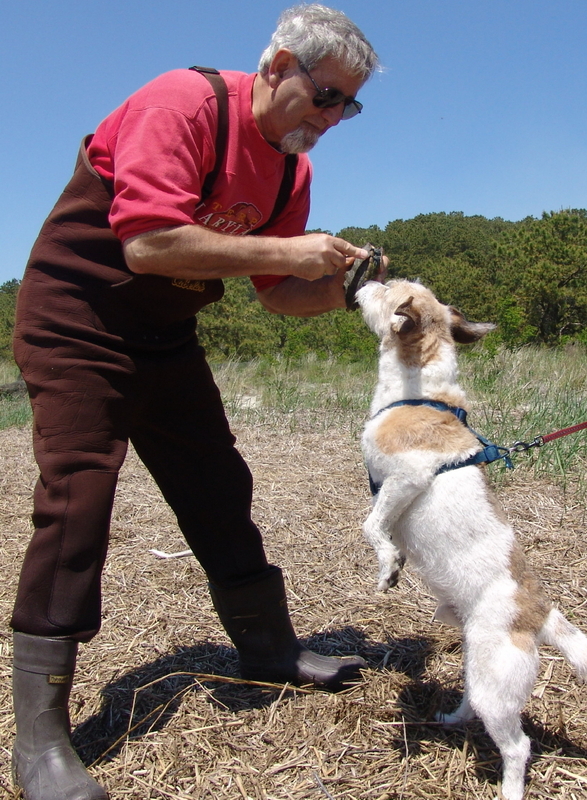 On a happier postscript, boy returned to the marsh a week later, perhaps to refresh memories of his puppy love. Older and wiser, he inspected the new set of bucket girls from afar. I could have sworn that he rubbed his paw across his nose as he waved goodbye to the new ladies of the bay. A beautiful spring day offered the Turtle Journal team an opportunity for exploration on the Outer Cape on Memorial Day 2009. In the mating aggregation in Chipman’s Cove, we captured eleven terrapins with waders and hand nets to supplement our spring census. Four were recaptures from previous years; seven were first timers; several were new recruits just entering sub-adult status. With time to spend while waiting for the holiday traffic jam to unsnarl along the Mid Cape Highway, we explored other natural, coastal venues and found some wonderful discoveries. 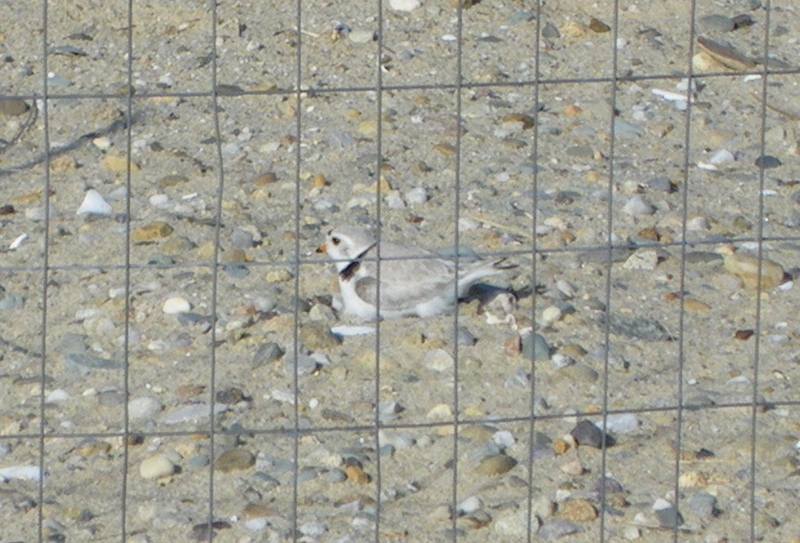 We ran into a nesting plover on a special barrier beach that is protected by volunteers from Mass Audubon’s Wellfleet Bay Wildlife Sanctuary. This exquisite, tiny creature that we shot through a telephoto lens rested on four eggs inside a roped off area with an inner predator excluder cage. 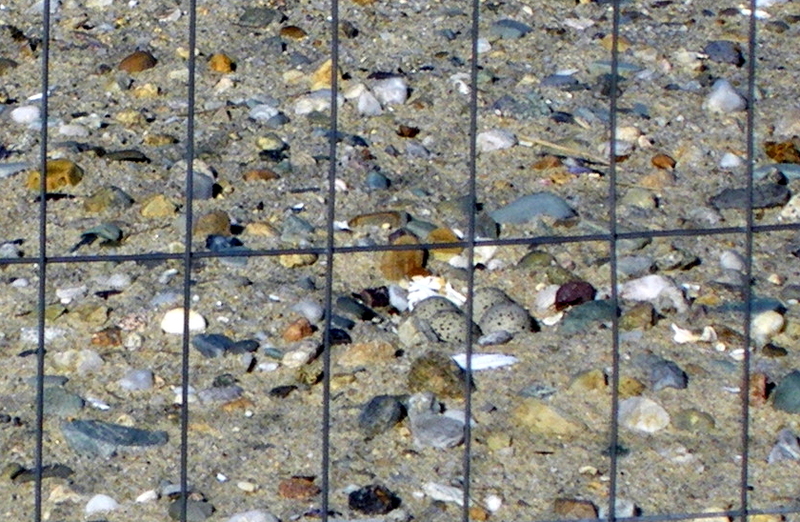 Neither the four camouflaged eggs nor the piping plover itself were easy to distinguish from the beach and gravel backdrop. 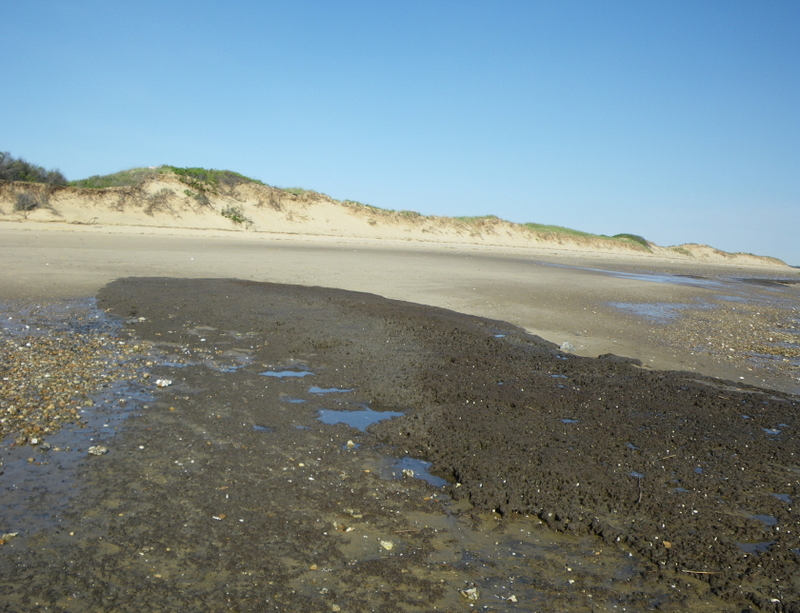 While the area seems well protected from humans and mammalian predators, the greatest concern in this location is the tremendous tidal forces that affect barrier beaches in Wellfleet Bay. With a 15 foot range from highest high to lowest low tides, an inopportune southwesterly blow that augments an astronomic tide could produce catastrophic results for these tiny, federally protected birds. On the west shore of Lieutenant Island where the Turtle Journal team found five pilot whale bone skeletons this last winter (see Discovery of Historic Pilot Whale Bones Hints at Cape Cod’s Past and Cape Cod Times “CapeCast: Pilot Whale Graveyard”), we explored a peaty area of former salt marsh that had been reclaimed by Cape Cod Bay over the centuries. This spot is seaward by 50 to 100 feet from the line where the pilot whale skeletons became exposed by storms and tides this winter. We had been watching a spot to the top left of this peat field in the photo above because we had discovered some rough hewn wood in March that we thought may indicate historic human activity. 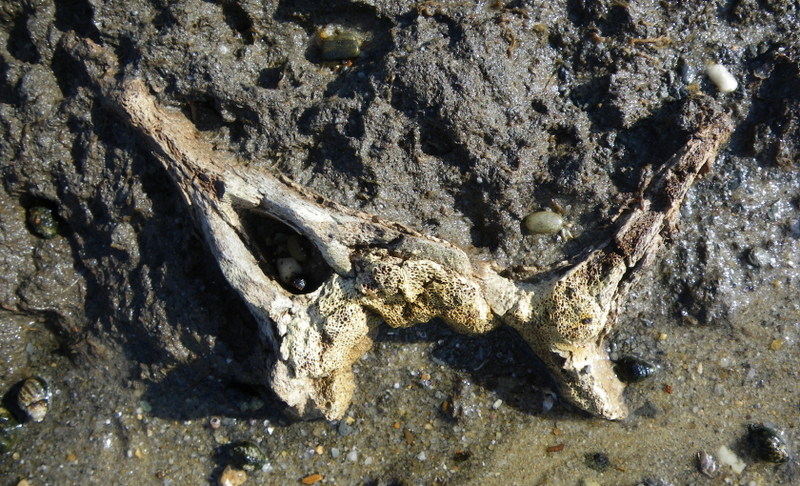 A piece of pilot whale bone had become exposed in the proximate area of the rough hewn wood that has disappeared. No other pieces of the skeleton have become exposed and we did not probe beneath the peat during this outing. In much worse condition that the bones we had discovered in the winter, the bone fragmented easily to the touch. No springtime trip to Lieutenant Island and the Outer Cape could be satisfying without a spending a few moments with the fiddlers of the flats. Male fiddler crabs sport enormous claws, some left-handed, some right-handed, that they use to attract females. Inspecting this one small, barren salt marsh area off Turtle Point, you can count thousands upon thousands upon thousands of male crabs dotted across the landscape like snowflakes, guarding the opening to their underground burrows and waving their huge fiddles into the air to grab the attention of any female crab bold enough to stroll throught he gauntlet. 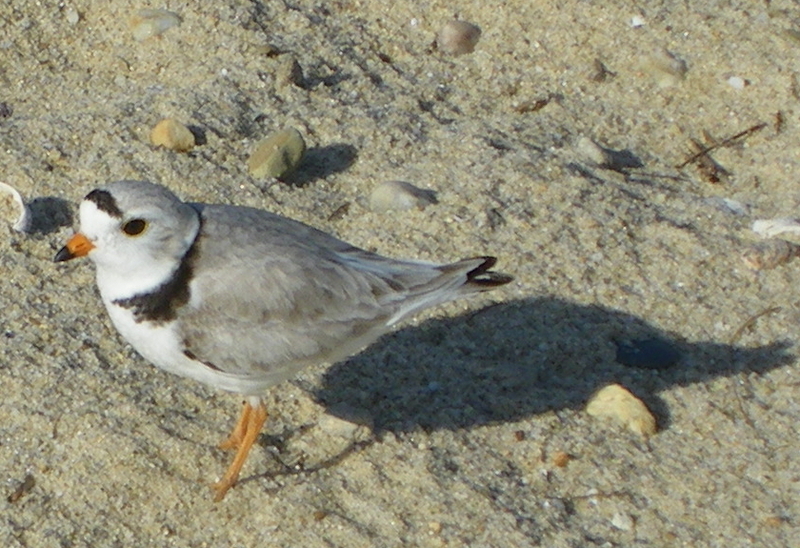 A glorious weekend of discovery at the cusp of another great research season on the Outer Cape. 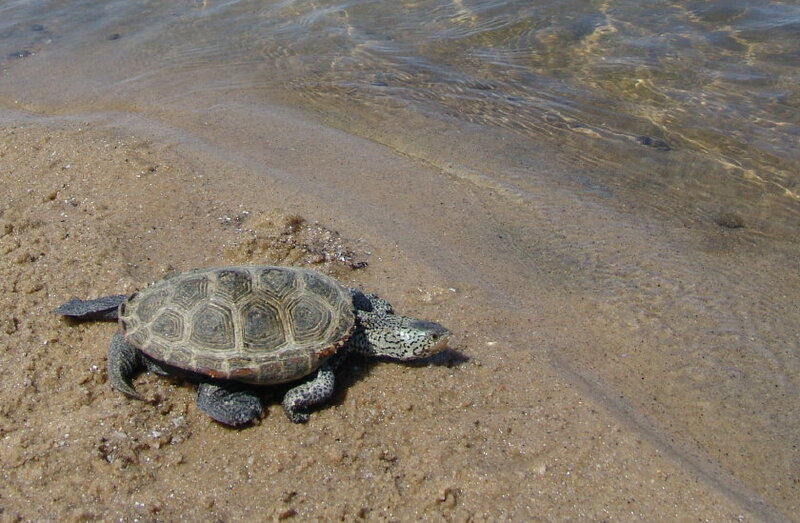 The westernmost population of diamondback terrapins in Massachusetts was discovered by the Turtle Journal team a few years ago in Assonet Bay off the Taunton River in between Freetown and Berkeley. Likely a small remnant or relic population in the now overly developed Taunton River estuary system, these terrapins may number less than 100 in total and have lost all connection with other terrapins along the Massachusetts coastline. 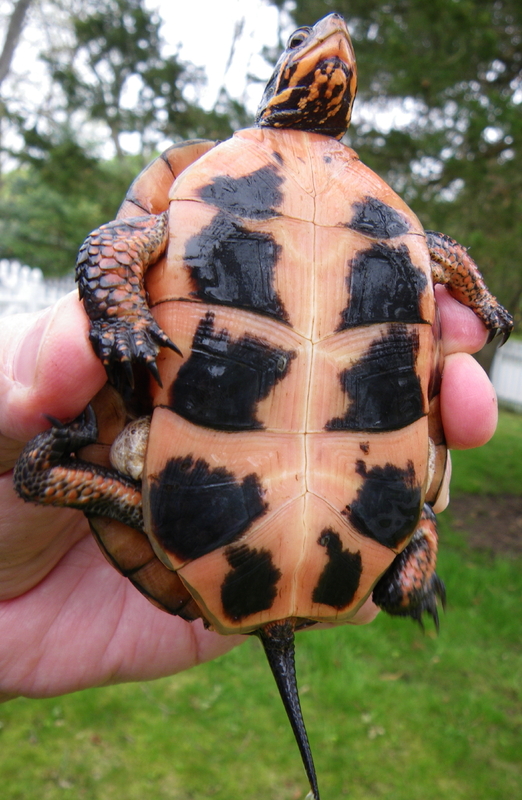 On Monday, the Turtle Journal’s ace reporter and researcher for the Assonet Bay system, Carl Brodeur of Arborcare with Ropes and Saddles, reported that three and a half-year-old Laurie Stonecypher found this adorable 2008 hatchling strolling along the road abutting Assonet Bay. 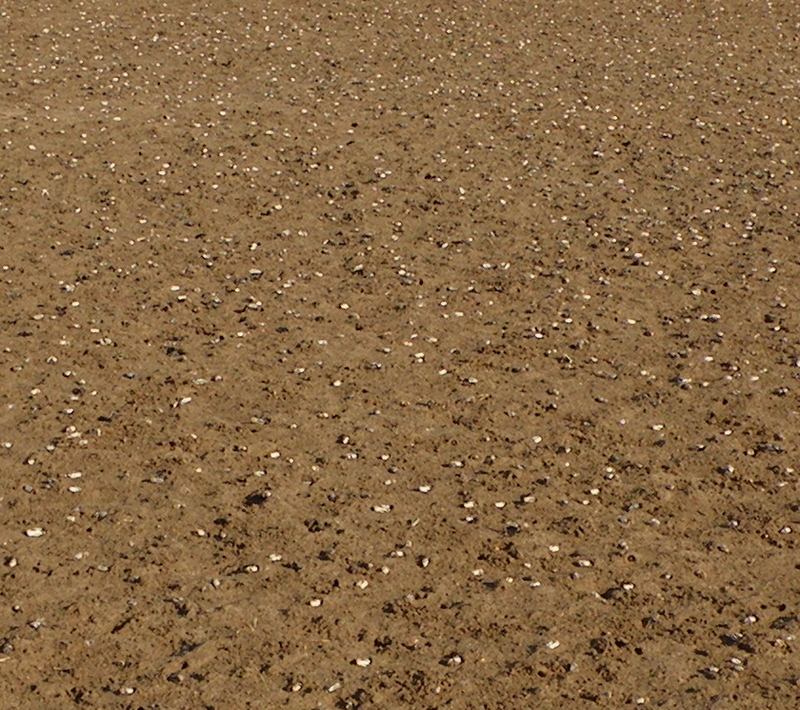 Terrapin hatchlings often spend their first winter burrowed upland rather than entering the salt marsh immediately after emerging from their eggs in the fall. The later in the season the hatchlings are born, the more likely they will remain upland until the next spring. Hats off to Laurie on her beautiful find. I guess when you’re a turtle researcher it pays to be close to the earth. Wellfleet Terrapin Grande Dame Looking Great at 54 Years Old! 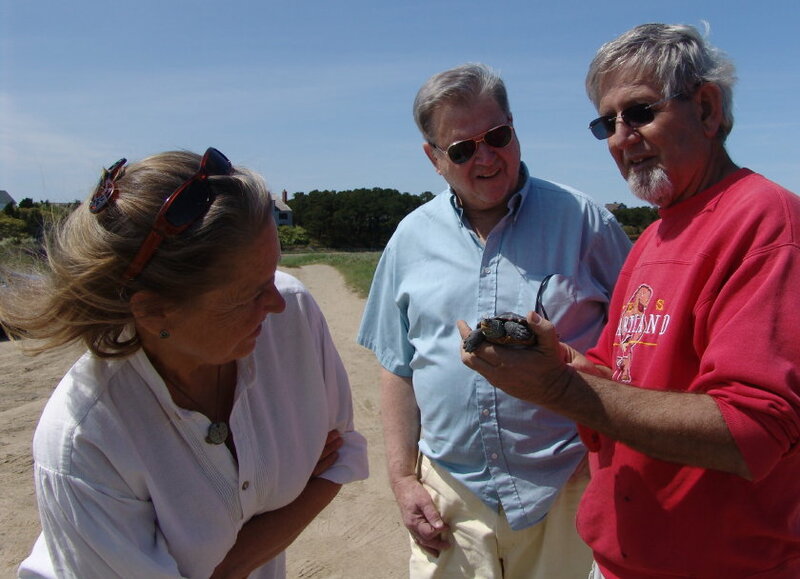 May 16th proved a perfect terrapin day in Wellfleet Bay. Skies were clear, the breeze was gentle from the southwest, and the tide was low. Diamondback terrapins, recently emerged from winter slumber, were swimming through the shallows of the tidal flats looking for love. The Turtle Journal team visited the cove between the south shore of Lieutenant Island and the Wellfleet Bay Wildlife Sanctuary in waders to conduct a spring population census. In ten to fifteen minutes of sampling, we netted 28 terrapins, 17 males and 11 females. Eight of these turtles were recaptures and 20 were seen for the first time. 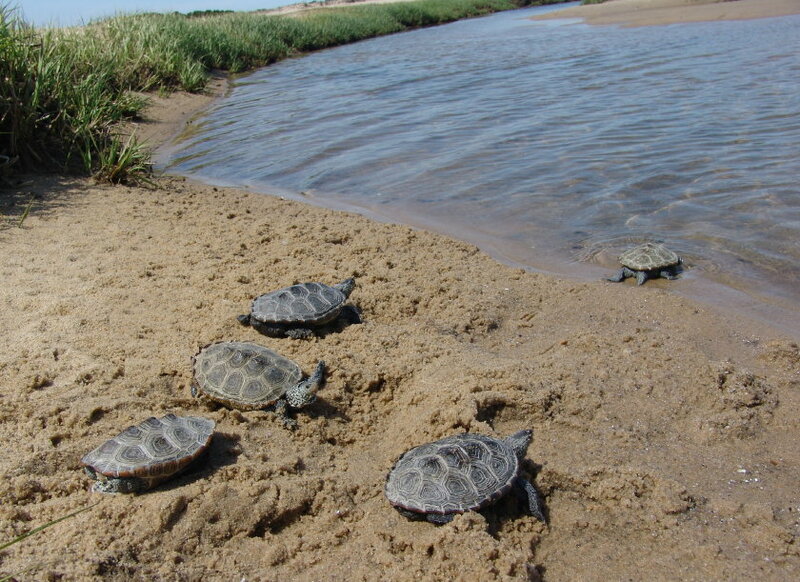 The 17 males proved the largest number of male terrapins from Wellfleet Bay that have been captured in a single event. Back to female terrapin #86, we scooped her up in water about three inches deep where she was being pursued by a young male about 8 years old. They both were netted together and quickly released after processing to resume their amorous intentions. Looking at her carapace above, you can see where she still shows the effects of a major trauma sustained in the early 1980s when her shell was cracked in an encounter with a vehicle. She’s extremely fortunate to have survived that event and to have avoided another such incident during her twice yearly nesting runs on Lieutenant Island in mid June and early July. 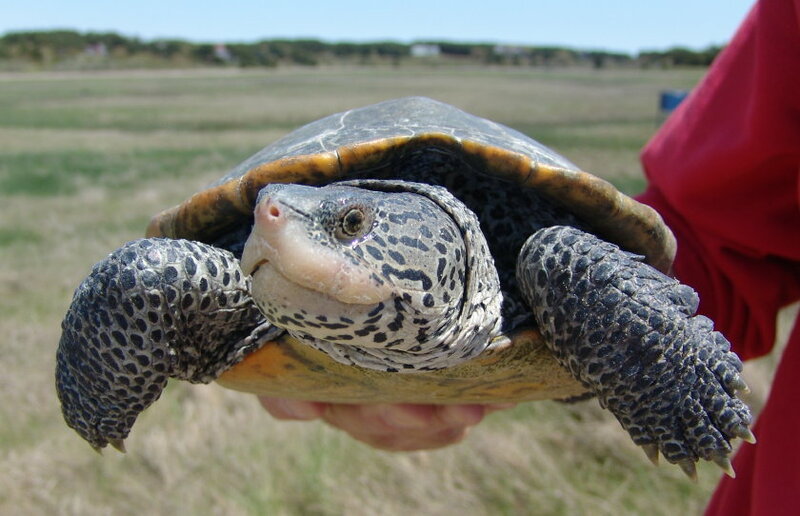 We are especially fond of the Grande Dame of Wellfleet’s terrapins because she was captured on June 20th, 1980 as she made a nesting run on Lieutenant Island’s Turtle Point at the very beginning of our Outer Cape terrapin study which began 29 years ago. Back then she was already so mature that her annual growth lines had vanished into history. But many years later when we reconstructed the growth chart of terrapins in Wellfleet Bay, we were able to discern that #86 had been more than 25 years old at her first meeting with researchers in 1980. We have listed her birth year as 1955, even though it is highly probable that she was born closer to 1950. Still, with yesterday’s capture, #86 has set the record for the oldest documented terrapin in Wellfleet Bay at a minimum of 54 years. Between 1980 when she was first seen and 1985 when next she appeared on a nesting run, she had sustained extreme trauma to her shell with cracks extending from the right rear quarter forward, as well as smaller areas of trauma on left front and back. You can still see the remnants of those wounds on her carapace today. We lost sight of #86 for more than a decade until she appeared on yet another nesting run at Turtle Point in June 2000, one day shy of the 20th anniversary of her first capture. She was seen on other nesting runs in 2001, 2002 and 2004; then disappeared for another five years. Yesterday marks the first time she has been captured in the water in an amorous interlude as opposed to on land en route to her nesting site. 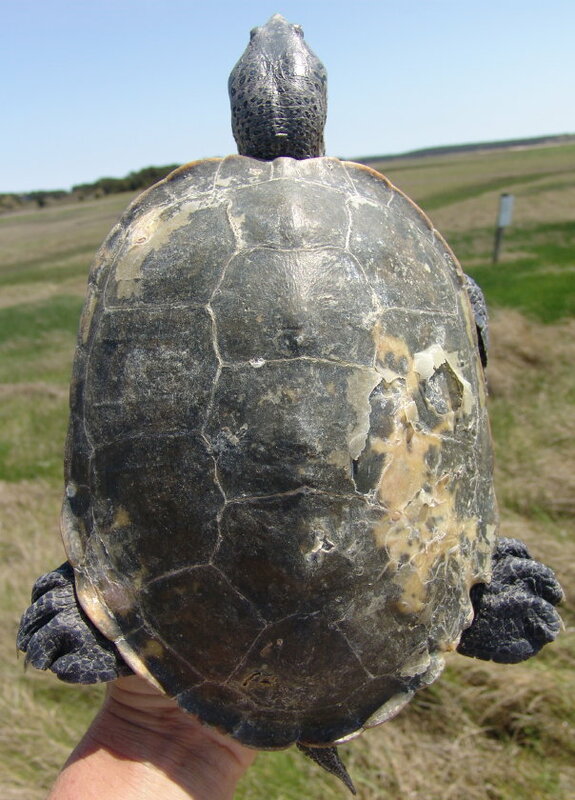 She is now one of the largest terrapins on the Outer Cape with a straight-line carapace length of 20.55 centimeters and weighing 1610 grams just after emerging from nearly seven months of winter brumation. 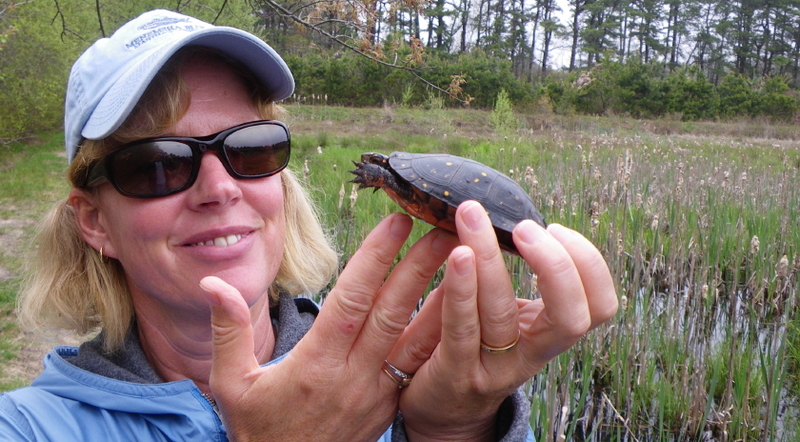 At a minimum age of 54, #86 is the oldest recorded terrapin in the Wellfleet Bay system. She has done more than her share to maintain the population of this threatened species, despite a near fatal encounter with humans in the early 80s. Clearly, she’s still an attractive turtle and if we are lucky and diligent this season, we’ll see her again around the 19th or 20th of June as she comes ashore at Turtle Point for her first nest of the season. In a soaking wet springtime, you take sunshine wherever you find it. 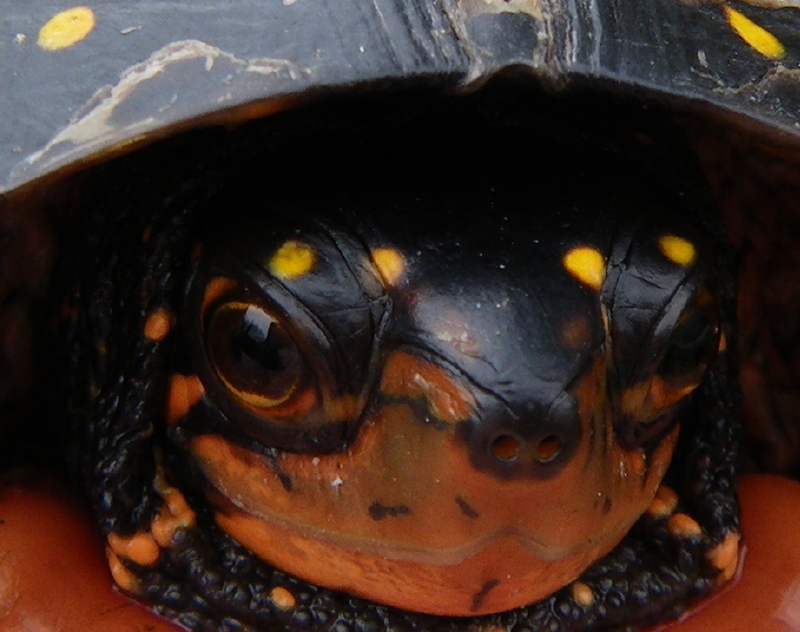 For Sue Wieber Nourse of the Turtle Journal team, a sunburst of color came in the sweet face of this gorgeous young female spotted turtle (Clemmys guttata) that Sue found swimming in a channel of Goldwitz Bog in Marion on the South Coast of Massachusetts. We have been monitoring this bog and its reptile species for the last half decade, yet Friday morning marked the first time we had found this young lady, now memoralized with the marking of #8 to match her youthful age. We have marveled at the “brilliance” of earlier naturalists who were able to come up with such a clever name for the species (smile). This youngster’s yellow spots were so pure that they seemed as though they were just dabbed onto her dark shell. What appears so gaudy when out of their habitat becomes a key camouflage feature when they return to the safety of the bog and the spots blend perfectly with duck weed and other similar “smears” in the abandoned cranberry bog channels. Examining her plastron (bottom side) provides an excellent illustration of this species’ sexual dichromatism. From birth, females sport a bright yellow-orange chin coloring and bright yellow-orange around the rim of their eyes, while males have a drab brown-gray coloration. Another indicator of gender is the flat “washboard” abdominals. Males have a concave indentation along the abdominal scutes. Finally, her tail is rather slim and slender, while the male tail is broad and chubby. After being marked, measured and weighed, Spotted Turtle #8 showed off her sunshine beauty and slipped back into the grayness of another rainy spring day. Within this abandoned bog, she is joined by painted turtles and snapping turtles, as well as a variety of snakes, frogs and toads. A few brave ducks swoop in to rest and feed, and a family of Canada geese with a half dozen goslings have taken temporary residence. Beware of the snappers, young goslings! 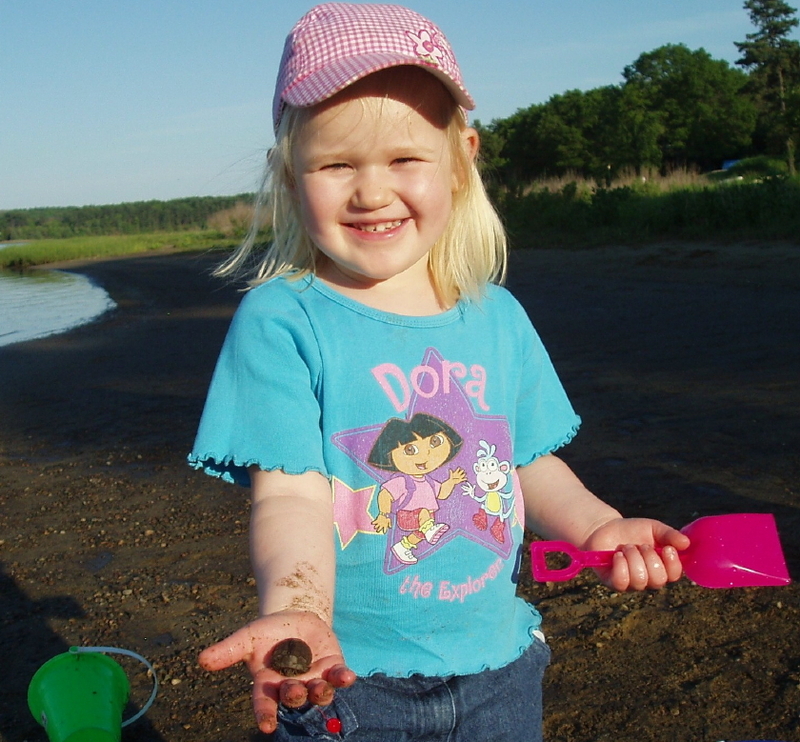 You are currently browsing the Turtle Journal blog archives for May, 2009.